Barcode .NET Standard SDK features 5 different libraries, which can be used to generate the most popular 1D barcodes, DataMatrix, Aztec, PDF417, and QRCode. It is fully compatible with WinForms, ASP.NET, ASP.NET MVC, .NET Core, Mono, Xamarin, and UWP; in other words, one DLL works fine across multiple platforms. It supports Codabar, Code 11, Code 39, Code 128, GS1-128, Interleaved 2/5, ITF-14, EAN 13, EAN 8, UPC-A, UPC-E, PDF417, DataMatrix, QRCode, and Aztec. It can export barcode data pattern, which allows barcodes to be rendered onto any device - virtual or physical. 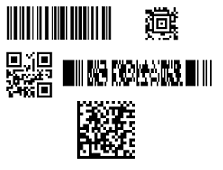 By leveraging .NET graphics or Google's SkiaSharp APIs, barcode images in a wide variety of formats can be generated. You can check out the following links for more information, please click the "Unblock" button in the "Properties" dialog of any .zip file before unzipping.